you can do some exploring on your own. If you are planning a short trip in Iceland, this is a perfect, economically-priced introduction to the Land of Fire and Ice! Approximate distance: ca200km / 124miles World-Famous National Park - Queen of Waterfalls - High Spouting Geysers- Geothermal Town lease note: If you have added extra nights in Reykjavík before your tour, the guide will meet your group for the start of the tour on Day 2 according to the standard "Geothermal Wonderland" itinerary. Pick up for the tour between 9:30-10:00 (9:30am - 10:00am). Please be at your assigned pick-up location no later than 9:30, as your location may be one of the first for tour pick-up. (Check your confirmation information for pick up location details. ) Make sure that your phone number and e-mail are listed with Iceland Travel so we can contact you if needed. Today visit the world-famous Golden circle natural wonders. A visit here introduces you to the powers of water and geothermal wonders that make Iceland so unique. You'll also discover Iceland's cultural heritage. Start with visiting Thingvellir National Park, a remarkable historical and geological site. The beautiful canyon running through the park is the meeting point of the European and North American tectonic plates. Thingvellir is where Vikings founded the Althing Parliament in 930 ADS, establishing Iceland as an independent nation. ext you will visit Gullfoss, a two-tiered waterfall where you will see thousands of tons of icy water thunder majestically down into a deep canyon. Some Icelanders believe Gullfoss to be the most beautiful waterfall in Iceland. Nearby you can find water in its hot form at Geysir geothermal area, where bubbling hot springs and geysers are abundant. The famous Strokkur is the most active geyser in the area, spouting up to 25-30 meters (82 - 98 feet) every few minutes. The Golden Circle leads to Hveragerdi, a town that sits in the most active hot spring valley in the country. Check into your hotel. elcome Walk: In the evening, a local guide will meet you at the hotel at 20:30 for a welcome walk. You will get to know the charming town, its history, geology and culture from a local perspective on an easy walking tour. You'll see the new hot spring area that was formed by a big earthquake in 2008, and even how to boil an egg in a hot spring. You'll also get a better understanding of how people use the hot springs water for heating up greenhouses, growing vegetables. You'll also hear first-hand what it feels like to live with a hot spring in the back yard! Dinner is on your own. Overnight in Hveragerdi." Enjoy the day YOUR way! Breakfast at your hotel. Lunch and dinner are on your own. Hveragerdi has been a resort town for Icelanders for almost a century, and so it offers many relaxing ways to have fun in the area. 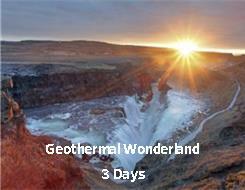 The town has restaurants and galleries and one of the country's largest geothermal pools. There is also a wellness center with spa treatments. f you like action, there are numerous guided activities such as horseback riding, snow shoeing, lava caving, Jeep touring and more. One of the most special tour options in the area is guided biking or hiking with the chance to bathe in a mountain hot spring. You can also book an optional tour with us to visit South Shore on a guided coach tour from Hveragerdi, visiting black sand beaches, two famous waterfalls and the leading edge of a glacier. In the evening there is an option to take a small-group northern lights tour; the area surrounding Hveragerdi is a good location to spot northern lights should they decide to make an appearance! Please book optional activities in advance to guarantee a seat on the tours. Overnight in Hveragerdi. Approximate distance: ca190km / 118miles Beautiful coastal views - Lunar Landscapes - Lively geothermal field - Blue Lagoon Breakfast at your hotel. Today you will be picked up by your guide between 09:30-10:00. (9:30am - 10:00am) Drive along a scenic coastal road where powerful waves thunder against the rocky shore and the surroundings are surreal. Visit Lake Kleifarvatn, set in fascinating, stark, moon-like surroundings. Thiswas the site of a famous Icelandic suspense novel, The Draining Lake, by Arnaldur Indridason. Near the lake's southern end lies Krisuvik geothermal field with powerful jets of sulphurous steam escaping from deep below the earth's crust. Here you can view numerous small hot springs, btightly-colored mud pots, boiling pools and other types of geothermal activity. Continue under low mountains along the shore, where craggy cliffs rise steeply from the sea. You also have the opportunity to take a walk on the Bridge between Continents. Here you can clearly see the Mid Atlantic ridge that divides the North American and European tectonic plates Visit Grindavík,a bustling town with a large fishing fleet. Nearby is the world-famous Blue Lagoon, where you can opt to spend time relaxing in the geothermal mineral waters. Head back to Reykjavik, returning in the late afternoon. The tour ends at the designated drop-off location (see your confirmation for details). This tour does not include pre or post hotel nights in Reykjavik. SITA Tours would be happy to assist you in booking your Reykjavik accommodation. Please let us know at booking time if you would like us to arrange Reykajvik accommodations.